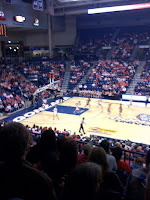 It was Pink Power night at the Gonzaga womens basketball game last night! The Kennel was a sea of pink! What a neat event for breast cancer awareness. I was a proud breast cancer survivor! LOVE MY NEW HURRICANE 12's. THEY ARE AN AWESOME SHOE. I HAVE HAD THEM FOR A LITTLE OVER A WEEK AND CONTINUE TO LOVE THEM MORE EACH TIME I RUN IN THEM. I HAVE WORN THE ENTIRE HURRICANE SERIES AND I THINK THIS ONE IS THE BEST YET. MUCH FIRMER HEAL AND RESPONSIVE FORE FOOT. ALL YOU HURRICANE USERS, GET A PAIR AS SOON AS THEY ARE AVAILABLE! It was an honor to have the USA cross country championships here in Spokane yesterday! 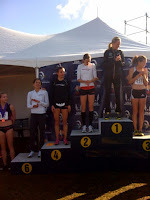 Two of Saucony's elite women, Molly Huddle and Magda Lewy placed 2nd and 4th. It was a blast to witness these women running! 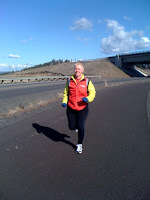 I saw alot of running friends and it was a beautiful day, 50 degrees and sunny, spring like weather! 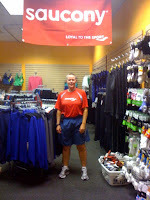 Had a great 8 mile run today. Beautiful in Spokane today. Went to the ER yesterday, slammed my finger in my truck door, x-ray showed no broken bones, just a swollen, cut finger! It feels great today. After what i went through the last 3 months, this is nothing. 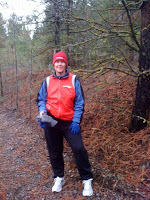 Everyone get outside and get active this weekend. Happy Friday to all. Got a new pair of Saucony Hurricanes today and can't wait to try them out tomorrow on my regular Friday run along the river. Life is good!!!!!! Got featured in the National Susan Komen February newsletter that is sent out to 400,000 people nationwide! What an honor!